Indian infantrymen of the 7th Rajput Regiment about to go on patrol on the Arakan front in Burma, 1944. During the Second World War (1939–1945), India was controlled by the United Kingdom, with the British holding territories in India including over five hundred autonomous Princely States; British India officially declared war on Nazi Germany in September 1939. The British Raj, as part of the Allied Nations, sent over two and a half million soldiers to fight under British command against the Axis powers. Additionally, several Indian Princely States provided large donations to support the Allied campaign during the War. India also provided the base for American operations in support of China in the China Burma India Theater. Indians fought with distinction throughout the world, including in the European theatre against Germany, in North Africa against Germany and Italy, in the South Asian region defending India against the Japanese and fighting the Japanese in Burma. Indians also aided in liberating British colonies such as Singapore and Hong Kong after the Japanese surrender in August 1945. Over 87,000 Indian soldiers (including those from modern day Pakistan, Nepal, and Bangladesh) died in World War II. Field Marshal Sir Claude Auchinleck, Commander-in-Chief of the Indian Army from 1942 asserted that the British "couldn't have come through both wars [World War I and II] if they hadn't had the Indian Army." Apart from this, Indian participation in the Allied campaign remained strong. The financial, industrial and military assistance of India formed a crucial component of the British campaign against Nazi Germany and Imperial Japan. India's strategic location at the tip of the Indian Ocean, its massive production of armaments, and its huge armed forces played a decisive role in halting the progress of Imperial Japan in the South-East Asian theatre. The Indian Army during World War II was one of the largest Allied forces contingents which took part in the North and East African Campaign, Western Desert Campaign. 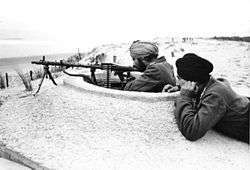 At the height of the World War, more than 2.5 million Indian troops were fighting Axis forces around the globe. 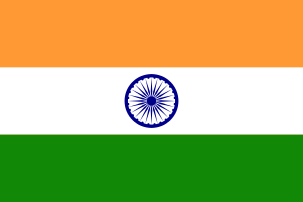 After the end of the World War, India emerged as the world's fourth largest industrial power and its increased political, economic and military influence paved the way for its independence from the United Kingdom in 1947. 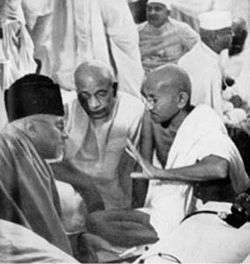 The Indian National Congress, led by Mohandas Karamchand Gandhi, Sardar Vallabhbhai Patel and Maulana Azad, denounced Nazi Germany but would not fight it or anyone else until India was independent. Congress launched the Quit India Movement in August 1942, refusing to co-operate in any way with the government until independence was granted. The government was ready for this move. It immediately arrested over 60,000 national and local Congress leaders, and then moved to suppress the violent reaction of Congress supporters. 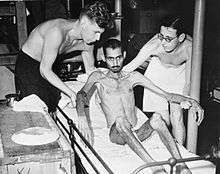 Key leaders were kept in prison until June 1945, although Gandhi was released in May 1944 because of his health. Congress, with its leaders incommunicado, played little role on the home front. The Muslim League rejected the Quit India movement and worked closely with the Raj authorities. In 1939 the British Indian Army numbered 205,000 men. It took in volunteers and by 1945 was the largest all-volunteer force in history, rising to over 2.5 million men. These forces included tank, artillery and airborne forces. 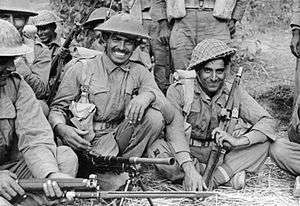 British Indian Army earned 17 Victoria Crosses during World War II. By 1942, neighbouring Burma was invaded by Japan, which by then had already captured the Indian territory of Andaman and Nicobar Islands. Japan gave nominal control of the islands to the Provisional Government of Free India on 21 October 1943, and in the following March, the Indian National Army with the help of Japan crossed into India and advanced as far as Kohima in Nagaland. This advance on the mainland of South Asia reached its farthest point on India territory, retreating from the Battle of Kohima in June and from that of Imphal on 3 July 1944. 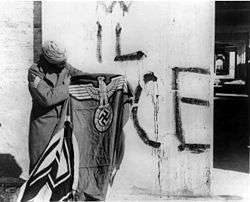 Indian forces played a role in liberating Italy from Nazi control. India contributed the 3rd largest Allied contingent in the Italian campaign after US and British forces. The 4th, 8th and 10th Divisions and 43rd Gurkha Infantry Brigade led the advance, notably at the gruelling Battle of Monte Cassino. The fought on the Gothic Line in 1944 and 1945. Berlin was encouraging but gave little help. Bose then approached Tokyo which gave him control of Indian forces it had organised. The Indian National Army (INA), formed first by Mohan Singh Deb, consisted initially of prisoners taken by the Japanese in Malaya and at Singapore who were offered the choice of serving the INA by Japan or remaining in very negative conditions in POW camps. Later, after it was reorganised under Subhas Chandra Bose, it drew civilian volunteers from Malaya and Burma. Ultimately, a force of under 40,000 was formed, although only two divisions ever participated in battle. Intelligence and special services groups from the INA were instrumental in destabilising the British Indian Army in the early stages of the Arakan offensive. 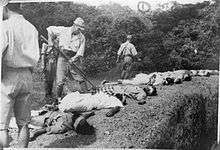 It was during this time that the British Military Intelligence began propaganda work to shield the true numbers who joined the INA, and also described stories of Japanese brutalities that indicated INA involvement. Further, the Indian press was prohibited from publishing any accounts whatsoever of the INA. As the Japanese offensive opened, the INA was sent into battle. Bose hoped to avoid set-piece battles for which it lacked arms, armament as well as man-power. Initially, he sought to obtain arms as well as increase its ranks from British Indian soldiers he hoped would defect to his cause. Once the Japanese forces were able to break the British defences at Imphal, he planned for the INA to cross the hills of North-East India into the Gangetic plain, where it was to work as a guerrilla army and expected to live off the land, garner support, supplies, and ranks from amongst the local populace to ultimately touch off a revolution. d) an increase in demand partially as a result of refugees from Burma and Bengal. Indian Economist Amartya Sen (1976) challenged this orthodoxy, reviving the claim that there was no shortage of food in Bengal and that the famine was caused by inflation. 1 2 Kux, Dennis. India and the United States: estranged democracies, 1941-1991. DIANE Publishing, 1992. ISBN 9781428981898. ↑ "Karnataka / Gulbarga News : Police yet to make headway in missing plane case". The Hindu. 5 May 2006. Retrieved 1 June 2013. 1 2 3 Bose, Subash Chandra. 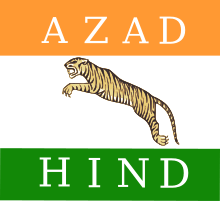 Azad Hind: writings and speeches, 1941-43. Anthem Press, 2004. ISBN 978-1-84331-083-9. ↑ Horn, Steve. The second attack on Pearl Harbor: Operation K and other Japanese attempts to bomb America in World War II. Naval Institute Press, 2005. ISBN 9781591143888. ↑ Khan, Yasmin (2008). The Great Partition: The Making of India and Pakistan. United States of America: Yale University Press. ISBN 978-0-300-14333-1. ↑ Manu Pubby (4 November 2006). "A mystery behind the history plane". Indian Express. Wikimedia Commons has media related to India in World War II.